The past meets the present in the design: Detailed engraving and cutting-edge finishing technologies bring the characters and setting to life, while the Star Trek font adds an authentic vintage feel to this tribute. 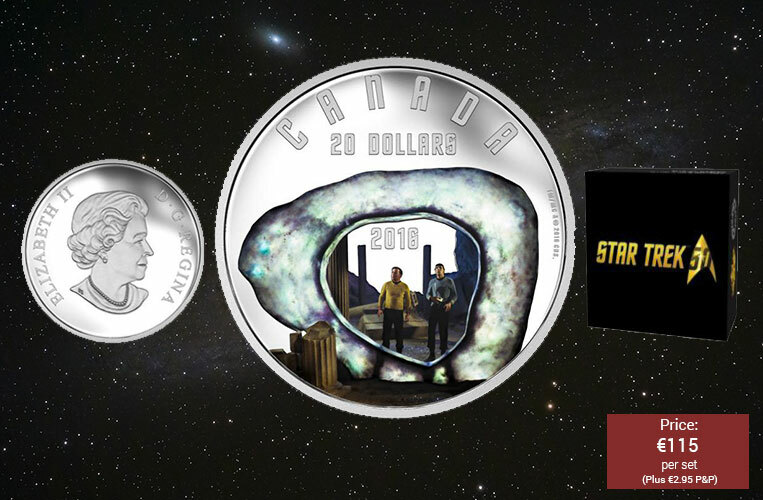 The reverse design recreates a key scene from the 1967 Star Trek episode, The City on the Edge of Forever. Vibrant colour brings to life the engraved image of Captain James T. Kirk (played by Canadian actor William Shatner) and Mr. Spock (portrayed by Leonard Nimoy); both in their famous Starfleet uniforms, they stand among the ruins before the oversized, ring-shaped entity known as The Guardian of Forever.